Caleb Nichols is at an exciting stage: after some 20 years of working in glass, he has reached the point where his ideas, not technical virtuosity, come first. As a result, his work has grown in size to 30-inch sculptural pieces and his imagery has expanded. Still inspired by the moods and vastness of the ocean, he has lately been pushing his concepts a step further. “It’s interesting,” he explains “the wilder and more colorful I make these pieces, the more they invoke a sense of calm. A funny kind of inverse effect.”In the process, he has discovered a new eloquence. “It’s taken me years,” he says “to make something simple and not have the urge to gussy it up.” Influenced by Japanese art, a quiet sensibility is poking through after years of experimenting in the studio. 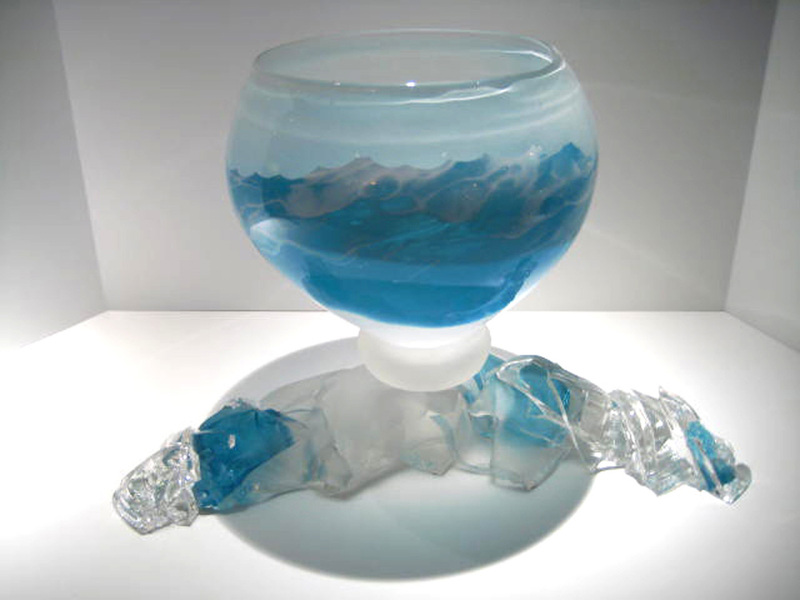 Like all other glass addicts, Nichols has done his share of obsessing on technique. In his quest to “build a better vocabulary,” he has mastered such standards as blowing, casting, annealing and fusing. He has even devised one of his own: smashing. “I blow these forms,” he states, “then hit them with a hammer.”This leaves him with chunks of glass that become fog, froth, foam, waves, beach stones and boulders in his fused works. The technique, which allows him to work bigger without requiring assistance, gives his work its distinctively rough dynamics. Interestingly, the medium brought him to the subject. Even though he has gone to Penobscot Bay in Maine “all my life” and seeks out Winslow Homers in museums, and even though he loves to sail and drive power boats and spends hours contemplating the ocean, he enrolled in studio arts at Tulane University to draw live models, not seascapes. There he stumbled into glass, got hooked, and the medium’s parallels with water brought him back to the jagged coast of Maine and his New England roots. 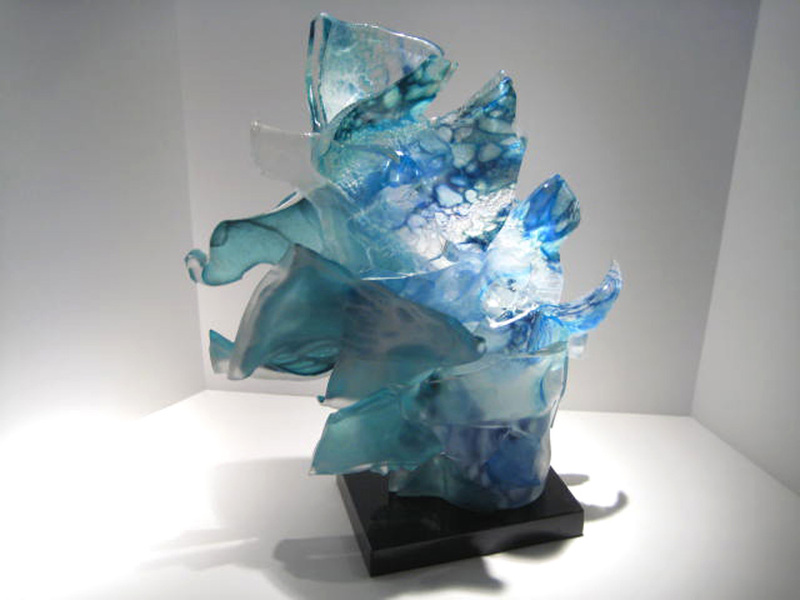 “I like to take the traditional idea of a seascape,” he explains, “and bring it into contemporary glass.